The captured essence of a rare gem, Versace Yellow Diamond radiates with a fiery intensity. Indulge in the luxury of pure transparency and voluptuous charm. The bright and sensual scent captivates with fresh and vivid notes and a confident charm, imbued with the unmistakable glamour of Versace. The scent bursts into light with its unusual blend of citrus notes at the opening, a delicate and airy heart of flora, and a sensual and refined dry down of woods and musks. A harmonious and vivid fragrance that emphasises the natural energy and femininity of a woman. *FREE Versace Yellow Diamond Eau de Toilette 5ml when you purchase the 50ml or above Versace Yellow Diamond Eau de Toilette Spray**. 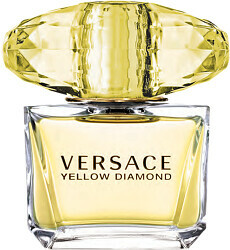 * One FREE Versace Yellow Diamond Eau de Toilette 5ml per order. **While stocks last. This product will be added to your basket automatically if your order qualifies for a free gift. Versace Yellow Diamond Eau de Toilette Spray is rated 5.0 out of 5 by 2. Rated 5 out of 5 by Busylizzie from Stunning perfume! I absolutely LOVE this Versace perfume. The fresh fragrance lasts well and is constantly admired. Will enjoy using it all winter. Rated 5 out of 5 by audisheena from Suitable for day or night Appeals to a range of ages, both my daughter & I have Versace Yellow Diamond.